This starts by using the safest, most effective cleaning and restoration methods known to our industry. With Jennings All Spruced Up, our goal is to make everyone we serve a customer for life. Which is why we ensure that our cleaning and restoration services are a step beyond the rest. Jennings All Spruced Up offers the best in tile & grout cleanig and sealing and wood floor steaming services. All of this resulting in the cleanest tile, grout, hardwood floors, VCT, carpets, rugs and upholstery possible. 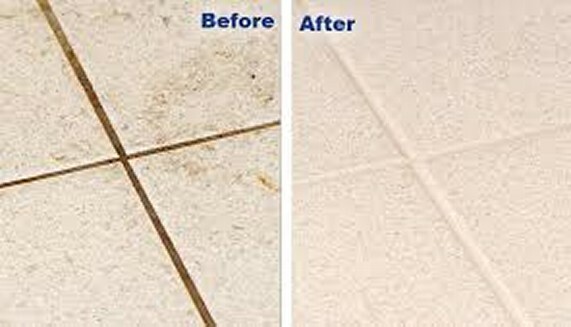 Jennings All Spruced Up, not only cleans the tile and grout properly, but seals it as well, giving your floors years of easy cleaning, beauty and protection. Once tile and grout is sealed properly it becomes much easier for you to clean throughout the year. Having your tile and grout cleaned and sealed once a year will make a big difference in the appearance and lifespan of your tiled floors. Using special cleaning solutions made for such surfaces and powerful extraction equipment, Jennings All Spruced Up extracts the dirt and grime from your tile, grout and stone, making it beautiful, clean and extending its life. Safeguard the health of your family and the beauty of your home with stone, tile and grout cleaning services from Jennings All Spruced Up. Porous grout, tile and stone can act like a dirt magnet, holding dust, dirt, and grimy particles. As these less than desirable substance build up in your stone or tile surfaces, they often become a breeding ground for disease causing bacteria. Having your bathrooms, kitchens, walls and other tile and stone surfaces professionally cleaned and sealed every 12 to 18 months will ensure a long lasting shine, and greatly reduce the amount of effort it takes to keep these areas clean, sanitary, and looking beautiful. Once we have your surfaces looking pristine, we can then apply a durable sealant that protects against dirt and other particles that can tarnish the look of stone, tile and grout. Cleaning wood floors the right way is a challenging task. Mops and brooms move the dirt around, and don't do the trick when it comes to extracting unseen, ground-in dirt and grime. Instead, call Jennings All Spruced Up to extract the dirt from deep within the cracks and crevices of your hardwood floor. Our deep restorative hardwood floor cleaning process uses a high-speed rotary brush and hypoallergenic cleaning solution to reach tough dirt and contaminants. As our technicians clean your floor, squeegees trap the dirt, and a powerful vacuum extracts the dirt, contaminates and left over cleaning solutions. We then restore the pH balance to your floor, which effectively also captures any remaining dirt and residue. The entire process is very effective and safe for your children and pets. After cleaning your hardwood floor Jennings All Spruced Up takes the hardwood floor cleaning process a step further by offering our protective floor polish. After your hardwood floors are cleaned, we apply our fast-drying hardwood floor polish for a uniform sheen that helps to extend the life of your floor. One quick fix to covering dirty, discolored grout lines is to apply a colored stain. This process can work for making grout lines look new again but will not prevent bacteria, water and stains from entering the grout lines. 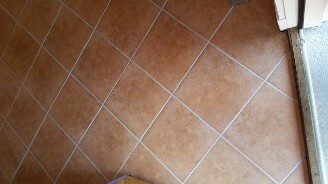 Using a colored based stain will only recolor the grout lines not seal the grout lines. The other disadvantage to colored stains is they will still discolor and begin to crack, chip or peel often within a few months of application. After deep cleaning your tile and grout Jennings All Spruced Up can apply Color Sealers both recolor the grout and seal the grout lines from bacteria and stains. 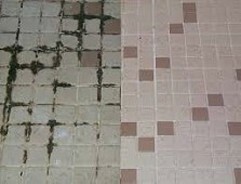 We guarantee our grout sealer against cracking, chipping and peeling. Always be sure to ask the company you hire if they are using a stain or a sealer, color sealer will leave your grout looking great for years to come! Marble: is a highly durable stone that exists in almost every color due to the variability of component minerals. Slate:Rich color palette that ranges from copper to red, navy to sage and tan to black. Granite: floor tile is distinguished by its small flecks at the surface yet varies in its richness of color and visual depth, making each stone a masterpiece of nature. Travertine: is a type of limestone that is a byproduct of hot springs. When formed, the minerals in travertines are mixed giving it unique patterns and character. Ceramic: is manufactured through the process of heating and cooling natural clay and minerals. To achieve the desired look and feel, ceramic floor tiles come in a wide array of colors, sizes, shapes and textures. 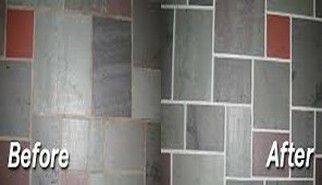 Ceramic is manufactured tile from natural clay. Porcelain: tile is created by heating more refined clay to higher temperatures creating a denser floor tile that can be used indoors and outdoors. Seen in a variety of textures, colors and sizes making it a perfect choice for any style.